New! The recommended websites for this book have been updated to include new video clips, vocab and grammar guides, quizzes and activities. Test your French with the puzzles below or choose a page number to visit the recommended websites for this book. A fast track guide to learning French with clear, simple explanations for beginners or anyone wanting to improve their French. Includes a simple, comic book story to show how the language works in everyday situations. Links to useful websites and free downloadable French picture puzzles via the Usborne Quicklinks Website. 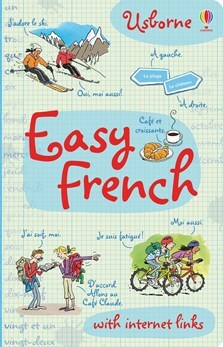 I have taken this book out of the Library and I would like to order it as it is a great book for learning French.